Here is the newest addition to handle most V6 and mid-sized vehicles. The DC800 introduces our new styling and product line for engines up to 4.2 liters. It also includes a computer management solution of your choice - Flash Chip, EFIE Max, or MAF/MAP sensor for diesel engines. The DC800 uses our proprietary design with laser cut plates with radiused corners. Each plate is then matched with a one eighth inch thick custom gasket and assembled between two commercially finished plastic end plates. The entire unit is torqued together using twelve stainless steel bolts that make the unit reliable and nearly indestructable. This system includes all the expected components. It starts with a 1.5 quart water reservoir paired with the installation accessories. 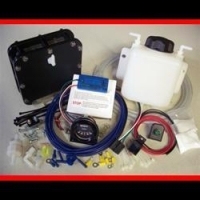 It then follows with a complete electrical harness package that contains 12 gauge wire, an amp gauge, a 20 amp circuit breaker as well as an automotive grade relay switch. This covers all needed connector and mounting hardware. No last minute runs to the hardware store with this system. Currently this unit is positioned between the DC450 and the DC1600 system. The overall dimensions are seven inches square and less than three inches thick. The bottom brackets are also of high grade stainless steel. If your vehicle is newer than 1996 we usually recommend the Fuel Saver Flash Chip for your computer management solution. It is easy to install and generally offers good results. If your vehicle is older than 1996 or you want more control over your computer, the EFIE Max is a better choice. The EFIE Max connects to all your oxygen sensors and allows for much greater gains and efficiency. It is more work to install, but provides some extra control you may want. Diesel engines require the MAF/MAP enhancer. For International clients please note we are no longer supplying the electrolyte due to shipping restrictions. We believe it is easier and more economical to locate this from a local source near you. Click Here to Visit a Popular Site for Electrolyte in the US and Canada. This unit is ready to install per the safety specifications of the plans. It comes with an Installation Overview and Diagrams along with our special electrolyte packets. If you want to upgrade your system with a PWM controller, click here to see our Easy Adjust unit and add it to your order.